The interior of the book is an accordion fold using paste paper. The letters were written using Doctor Martin's Bleed Proof White. For the Spanish lettering, a Gillot 404 pointed pen nib was used and a small Brause nib for the English letters. 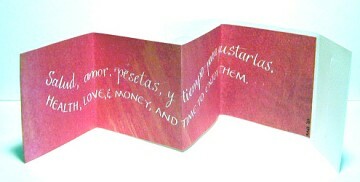 The cover wraps around and has an embossed heart and slit closure and was made with Canson Mi Tientes White. The dimensions of the closed book are approximately 2¾" (6.3 cm) square.